This tutorial contains instructions o how to disable Bitlocker Protection and Drive encryption in Windows 10. As you may know, the BitLocker encryption feature which is available in Windows 10 pro and enterprise versions, can help you to protect your PC contents from unauthorized access. But sometimes there is the need to disable the Bitlocker on Windows 10, so in this guide you can find how to do that. 1. If the Bitlocker Recovery Key or Password is not accepted at system startup then try to unlock and decrypt the hard drive to another Windows 10 computer or try to : Unlock and Decrypt the Protected Drive in the Windows Recovery Environment (WinRE). 2. If you Cannot Unlock the Drive (e.g. If don't own the BitLocker Recovery Key or because the BitLocker key is not accepted) and you want to remove the BitLocker encryption in order to use the protected drive again, then read this tutorial: How to Remove BitLocker Protection from a Drive Without the BitLocker Recovery key or Password. After booting to Windows then follow the instructions below to disable the bitlocker protection and to decrypt the drive. How to Turn Off BitLocker Protection and Decrypt a Bitlocker Encrypted Drive in Windows 10. In order to turn off the Bitlocker protection, you must have the Bitlocker password or the bitlocker recovery key in order to unlock the drive first and then to decrypt the drive. On a printout you saved, when you enabled Bitlocker. On a USB drive you used, during the Bitlocker activation to save the Bitlocker recover key. At the Microsoft Account Recovery Keys, by using the MS account you using to login to your device, or you have added to the device in order to download apps from Microsoft Store, or to activate MS Office or for email. On your Azure Account for work PC's that login with an Azure Active Directory account. Method 1. Disable BitLocker Protection from Windows GUI. Method 2. Disable BitLocker & Decrypt a Bitlocker Encrypted Drive from PowerShell. Method 1. How to Turn Off Bitlocker Protection in Windows 10 GUI. 1. Navigate to Windows Control Panel -> System and Security and then click Bit Locker Drive Encryption. 3. After Turning Off the Bitlocker, then click at the Bitlocker icon in the taskbar to view the decryption process. 1. Open Windows Explorer and then double click on the locked drive. 2. Enter the Bitlocker password or click More Options to enter the Bitlocker Recovery key, in order to unlock the drive. Method 2. How to Turn OFF BitLocker Protection & Decrypt a Bitlocker Encrypted Drive from PowerShell in Windows 10. 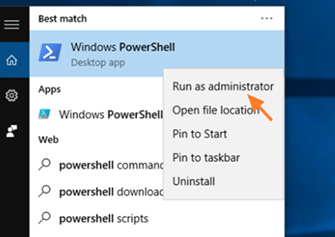 Right click on Windows PowerShell result and select Run as administrator. 6. If the 'Lock Status' shows Unlocked and the 'Conversion Status' shows Fully Decrypted, you're done! Please leave a comment in the comment section below or even better: like and share this blog post in the social networks to help spread the word about this problem.